1) Studies of crustal heterogeneity around earthquake source regions and active faults to improve long-term evaluations of earthquake occurrence. 2) Studies of the regional and global conductivity structure of the Earth’s interior. 3) Studies on the recovery process of the Nojima fault following the Kobe earthquake. 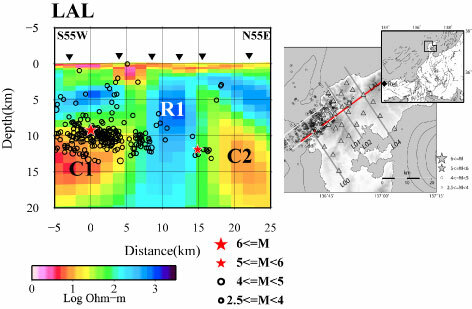 Resistivity structure to a depth of 20km in the region of the 2007 Noto Peninsula Earthquake (Mw6.7). Aftershocks are shown by the black circles in the cross section on the left and the map view on the right.